Ahem and Rashi were surprised to see the house being decorated.Also a cake on the table. Kokila,Janko and Gopi wished them:Happy wedding anniversary. Rashi:Gopi…thank you so much.It looks very pretty. Rashi held Ahem closer romantically:Happy anniversary Jaana. Ahem:Happy anniversary to you too. and fed each other romantically. Janko:Gopi has cooked your favourite food too for the evening party.And one more sweet cake by Gopi. Rashi:Wow Gopu..you are the best friend anyone can get. Gopi:You are the best friend anyone can get.I am very lucky to have you as my friend. Ahem:You both are lucky to have each other. Kokila:Get ready guys for the wedding anniversary party. Ahem was waiting for Rashi. Ahem:Rashi is taking too much of time to dress up. Janko:Let her dress up.This is her day too. Gopi:Ahem is restless.He can’t be away from Rashi even for a moment. Rashi came wearing a golden gown.Ahem was lost in her beauty.Rashi blushed. Ahem:Hi everyone..today is the day Rashi became my life.Our love became more passionate after marriage. She is the most important person of my life.My life is impossible without this Angel. I love you Rashi and I thank you for marrying me and filling my life with love. Rashi cupped his face in his hands:I love you too Jaana. Rashi embraced him with lots of love. Gopi:Happy wedding anniversary my dear friends. Rashi:Thank you Gopu.The food made the party more grand. Gopi:Let us cut the cake.I specially baked for both of you. They both cut the cake together and fed each other. They fed cake to Gopi too. They put music and danced. Gopi:Ahem and Rashi are made for each other.Let God bless them and they live happily for many years. Janko:You too will get love in your life like Rashi. 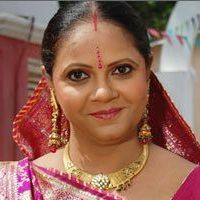 Kokila:You are a nice girl and your Prince will enter your life soon. Gopi:No..I am not lucky enough to get love.Only a few people get love in their lives.I am unfortunate in that. Janko:Don’t be so pessimist Gopi.Have hopes. Gopi:Hope has no place in my life Baa. Janko:Gopi should not lose hope and fall into despair.I will make sure that Jaggi and Gopi unite.Kokila…tell Jaggi to come soon. Kokila:Jaggi is coming tomorrow Maa.He will be here for 2 months vacation. Janko:Thank God…Jaggi is reaching here on correct time. Ahem-Rashi swayed to romantic music. Rashi blushed:What’s your intention Ahem? He pulled her closer.She blushed:Ahem. Gopi is cooking in the kitchen.Rashi came. Rashi:Wah Gopi…nice smell is coming.Guess the food is yummy. Rashi:This is potato curry.This was Jaggi’s favourite. Gopi:Rashi…Ahem said that Jaggi is in Dubai. Rashi:Yes.Jaggi is having a good job in Dubai.He comes here for vacation. Rashi:What a question Gopi!We are his family. Gopi was shocked:He has’nt married yet?Why? She thought:Oh God..because of me Jaggi is leading a lonely life.The guilt is killing me. Rashi:I did’nt say this to make you upset Gopi.It’s not your fault.You were right in your place.It’s not easy to love anyone. Gopi:But I loved the wrong person. Gopi’s eyes became teary.Rashi wiped her tears and hugged her. Ahem went near Rashi with tickets. 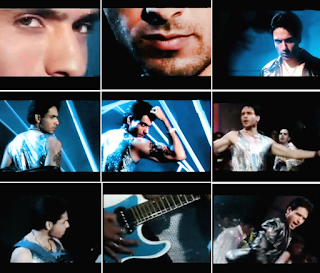 Ahem:Yes.I have booked tickets for your favourite singer Angad’s music concert. Rashi:Shall we call Gopi also.She will be bored sitting at home. As they called Gopi too joined them to the concert. Janko:Oh no.When Jaggi reaches here Gopi won’t be here. Kokila:Don’t worry Maa.We will send Jaggi for the concert.Let him be surprised. Janko:Good idea.Both Gopi and Jaggi will get the best surprise when they see each other in an unexpected way. Ahem,Rashi and Gopi were engrossed in Angad’s concert. Jaggi reached home. Janko and Kokila were very happy. Jaggi:Where are Ahem and Rashi? Janko:They have gone for a music concert.You too go there.We bought ticket for you too. Jaggi:Nice idea.I will surprise them. Janko and Kokila smiled at each other. Kokila messaged Ahem and Rashi about Jaggi’s visit. Ahem:Jaggi is coming here to surprise us.But he is going to get the real surprise. Gopi:Rashi…I will go to the washroom and come. Rashi:I guess it’s because of AC.You go and come. Gopi went to the washroom.Then walked to the hall. Suddenly she bumped into someone. They both looked at each other. I mean to say, last scene was good i mean gopi bumped at someone wondering on whom she bumped !